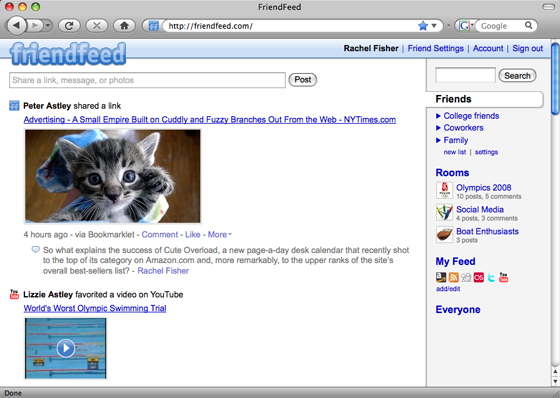 FriendFeed, the popular social activity aggregator, has written a blog post announcing a new redesign of the site that is currently in public beta. You can check out the site at http://beta.friendfeed.com/. Among the highlights of the new design are Friend Lists, which allow users to separate their friends into discrete groups (much as they would in Facebook’s list feature). Users can also use the new Friend lists to prioritize their incoming activity streams by segregating their less interesting friends to a separate list so they don’t always appear in the default feed. The Friend Lists also support “Fake Following” – a seemingly unintuitive feature that allows users to look like they’re following their friends without actually getting their updates. Users often expect to have their “Follows” reciprocated by their peers, and a failure to do so can lead to bruised egos. But indiscriminate following comes with a price too, as it ultimately leads to an unmanageable amount of noise (and stories you might not care about). Fake Following manages to skirt the issue with a digital white lie, and is a feature Twitter (which has a similar system) should offer too. Also included with the update is a new photo feature, which allows users to upload photos alongside their their posts without installing a plugin. Finally, users will also be able to view other users’ home feeds. While this may sound a bit creepy at first, the feeds will only display information that is publicly available anyway, but in a more organized fashion. To ensure privacy, these feeds will also ignore Friends Lists, so outside users won’t be able to tell which Friend List you’ve put them on.